What would a week at Inductive Automation’s training center mean for you? Whether you have little or much experience using Ignition, you’ll be sure to learn a lot – just like Jerry Buthmann. Jerry Buthmann is a hard working guy from Albany, Ore., who we were lucky enough to have in our training course recently. Jerry works for Concept Systems Inc. as a senior engineer. Concept Systems has had recent success using Ignition to create powerful and dynamic HMI portals for their clients. Their recent growth in that area has caused them to expand their Ignition integration team. Jerry explained that he was asked to bring his engineering expertise to the group. "I agreed to help out, so they asked me to attend the Ignition 5-Day core training course,” Jerry said. “I came to better learn how to use Ignition to help our clients." 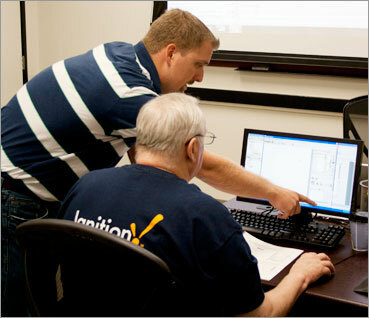 Travis Cox, Inductive Automation's director of training and support services, works with Jerry Buthman, senior engineer for Concept Systems, during an Ignition training course. Jerry is a newcomer to Ignition but is a stalwart in the field of automation, thanks to his 27 years of experience in the industry. "I have had some exposure to other SCADA programs before, but as a control systems engineer my main focus has been working with Rockwell and Controllogix PLC programing." Jerry continued, "I had zero experience with Ignition prior to taking the training course, so I had a lot of ground to cover." Thanks to Jerry's expertise and the solid instruction of Travis Cox, Inductive Automation's director of training and support services, Jerry was able to catch on quickly. "The course is well organized and the instruction was easy to follow," said Jerry. "Before long I was fairly comfortable working with the software. Ignition has a lot of the coding and implementation functionality built into it, so I was able to build a dynamic SCADA project in the design module pretty quickly." Throughout the course Jerry learned the core skills needed to effectively use Ignition. "Before attending the course, the idea of using an entirely new SCADA software was a bit overwhelming," Jerry explained. "Now I feel much more confident in using Ignition to create new projects. It's a big, powerful application so I still have a lot to learn, but this course has really helped me out. I also know the folks here are ready to help me if I have more questions." Working with Jerry, and the other Ignition training course attendees like him, is a pleasure for us here at Inductive Automation. We are always happy to help our clients everyday, but it's a special privilege to connect with them one-on-one in the training room. If you want to learn more about how to use Ignition, we encourage you to attend one of our training courses offered monthly. "The facilities are great, the information was well delivered, and the food was good too,” Jerry said. “I would absolutely recommend the training course to any colleague of mine who wanted to become more proficient in Ignition." Thanks Jerry, it was great to meet you, and we hope to hear from you again soon. Concept Systems Inc. is recognized as a leader in automation services. The company is headquartered in Albany, Ore., and has been meeting its customers' needs since 1999. Concept systems has built a reputation for applying proven automation technologies like Ignition to optimize the manufacturing processes of their clients.